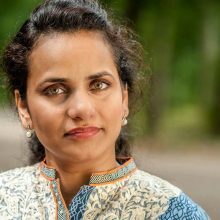 Anila Noor is the founder of New Women Connectors, a movement striving for mainstreaming the unheard voices of migrant and refugee especially women living across Europe. New Women Connectors is a perspective-shift to the refugee agenda and advocates inclusion than integration as a policy choice. The movement also helps newcomer refugee to lift their spirits and make something of it. She found herself involved in the subjects of forced migration and identity crisis, when she had to go through the same experience. Since, she has been working as a strong voice, focusing Forced Migration, Asylum, Refugee Policies and Advocacy for the rights of Migrants. Noor is currently working on the subject of Receiving Refugees in Urban Settings: Narratives from the Netherlands and other European countries. As a human rights advocate she wants more positive stories of migrants/Refugee to be heard. Noor’s work helps her to counter her disappointments as she observed that “perspectives of refugees and migrants are rarely included in the policies aimed at them”. She constantly strives to adapt improve and innovate. Anila is a proud migrant/refugee, a Policy Advisory for the Municipality of Amsterdam, and a fellow of Open Society Foundation and member of European Migrant Advisory Board – an initiative of the Partnership on Inclusion of Migrants and Refugees the Urban Agenda for the EU.